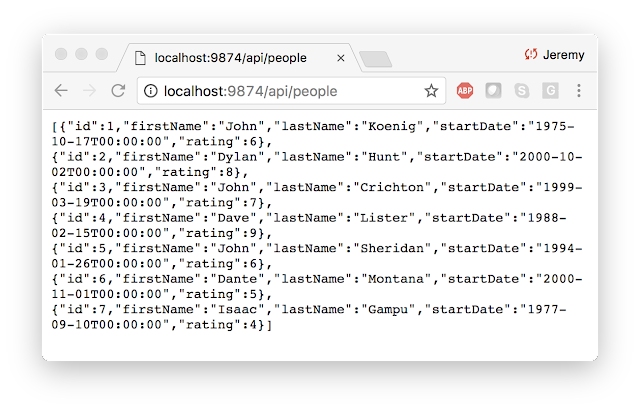 Last time, we built a WebAPI service using .NET Core 2.0. This time, we'll write a console application/library that consumes it. Our goal today is to create a console project, make a service call, and use a NuGet package to help us parse the data. This is part of the initial port of my Task sample code. Today we'll build the console application and get data from the service. In a later article, we'll explore Task in more detail. 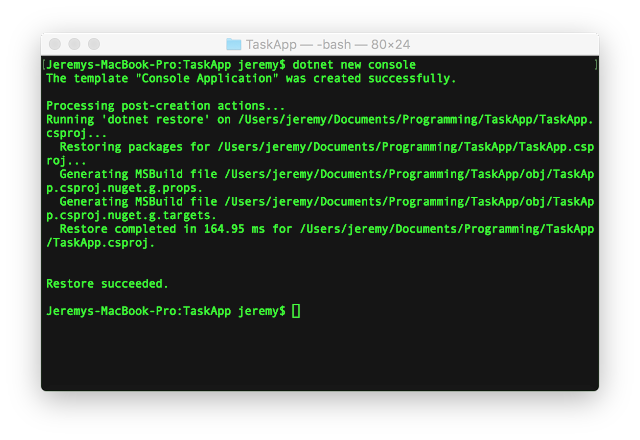 Note: This code is available on GitHub: jeremybytes/task-app-core. We'll also use the service created previously at GitHub: jeremybytes/person-api-core. 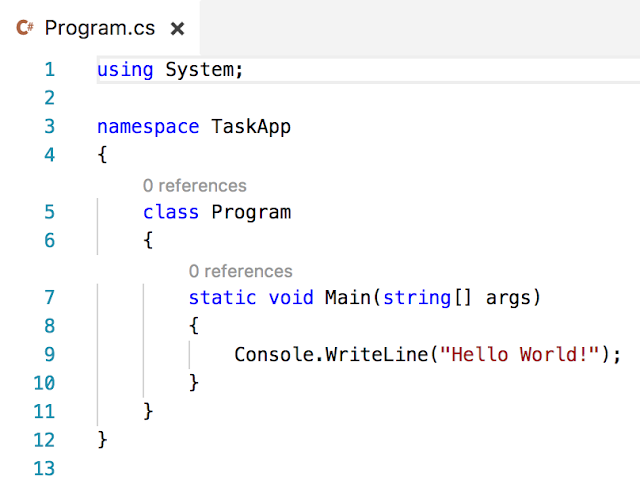 As with the service project, I'll be using the command-line interface (CLI) along with Visual Studio Code. I'm on macOS, but this will work the same on Windows 10. Also, as before, I'm starting with (1) the .NET Core SDK, (2) Visual Studio Code, and (3) the Visual Studio Code C# extension already installed. You can check the resources on the Microsoft announcement article to get the environment set up. to create a new console application project with the same name: TaskApp.csproj. 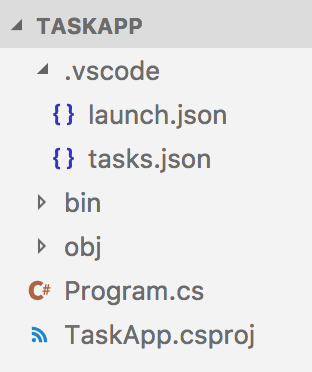 From here, we can open the "TaskApp" folder in Visual Studio Code. When we click "Yes", Visual Studio Code will add a ".vscode" folder and a couple of files. to build our console application. It looks like everything is working so far. 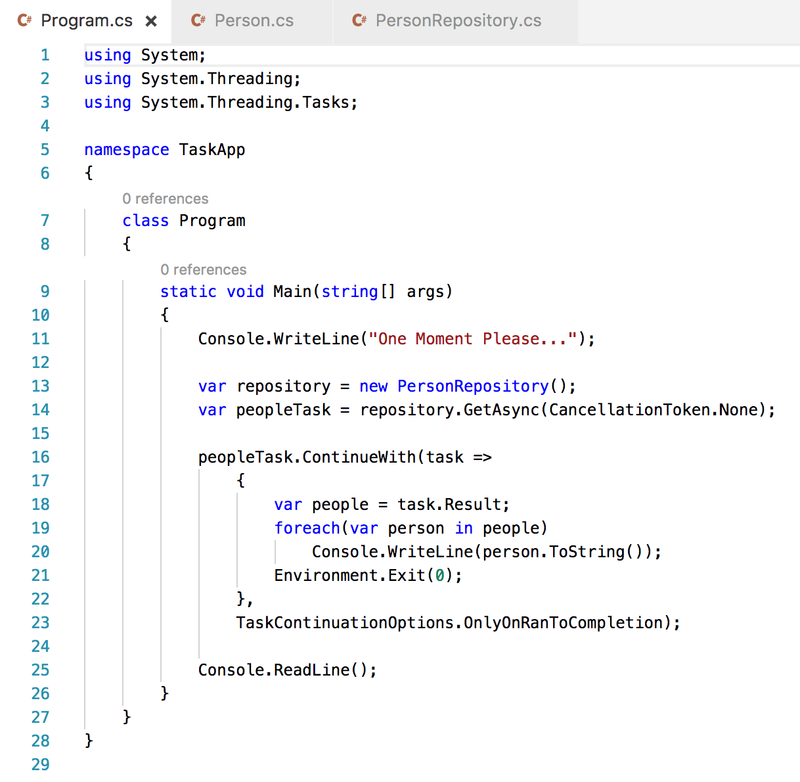 Visual Studio Code supports solutions that allow us to group multiple projects together. 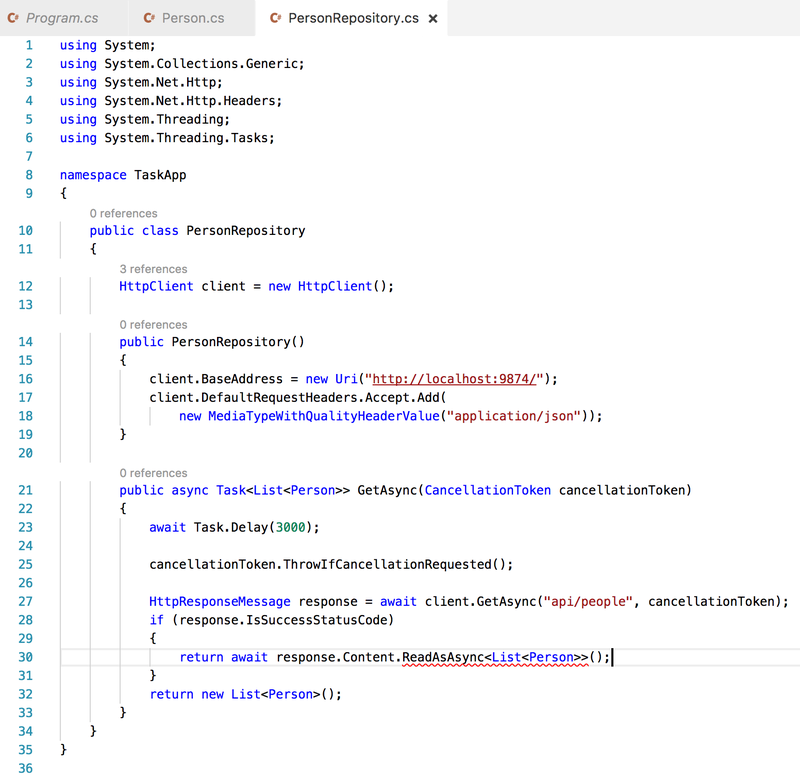 So why do we have the WebAPI service and console application completely separated? to start up the self-hosted service. Then we can leave this terminal window open (and the service running) while we work on the console application in a different terminal window. It may not be the best solution, but it was easy for me to set up and keep track of what is running. I can also easily shut down the service to test the error handling of the application (as we'll see in a future article). In addition, the full project that this code is based on uses a separate library for the repository. To keep things simple, we'll put the repository class right in the console application. As I get more comfortable with the environment, I may change my approach on this. But I think it works out fine for this sample. With the project set up, we'll need to write some code to call the service. 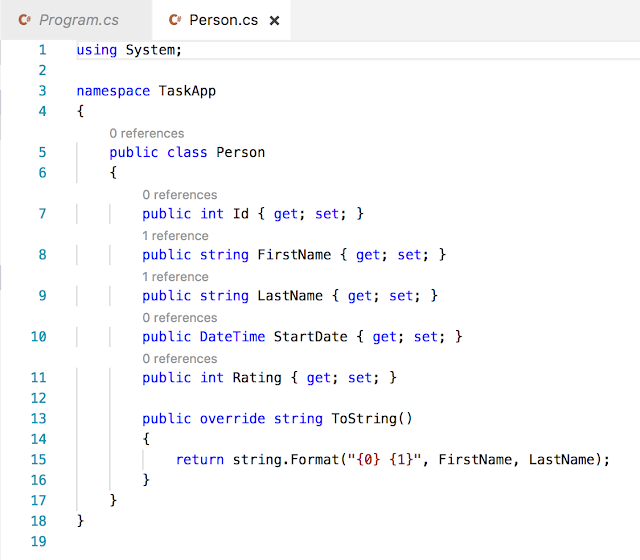 But before that, we'll add the data class that describes a custom type. 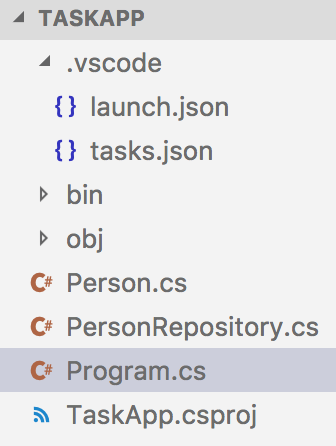 We're dealing with "Person" objects, so we can add a "Person.cs" file to our project. This class is available on GitHub: Person.cs, and it has the same members as the class in the service project. To keep things simple, we'll just copy the code over and change the namespace to match our console project. I don't really like the idea of duplicating code from the service. This is something I'll be working to make a bit better in the future. For now it does get the job done. Now that we have the type of our data, we can make the service call. 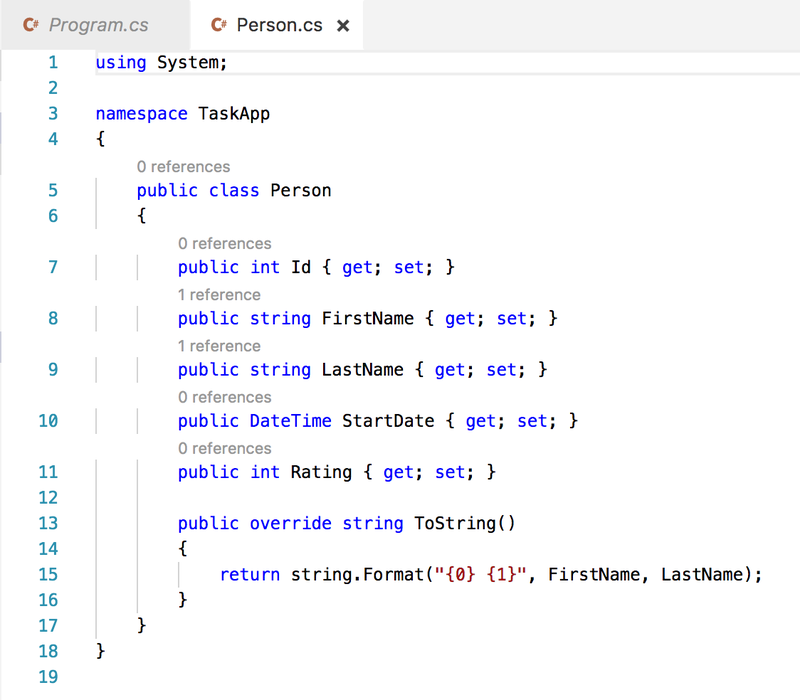 This code can come almost straight across from the .NET 4.6 project that it is based on. There's just one change we really need to make. This code uses the HttpClient class to get data from our WebApi service. There's also a bit of asynchronicity added to demonstrate Task and await (including an artificial 3 second delay). We won't worry about those parts too much today; we'll look at them in the future. Notice that we have some red squigglies. This is because "ReadAsAsync<T>" does not exist in the .NET Core library. Instead we'll need to do a bit of parsing ourselves. And for that we'll use the Newtonsoft.Json NuGet package. One quirk about using this approach is that we need to know the exact name of the NuGet package. This isn't much different from using the NuGet command line tools in Visual Studio, but I don't know anyone who actually uses those regularly. Most folks I've come across (including myself) use the UI-based tools in VS. If needed, we can always search for the packages using https://www.nuget.org/. When we flip back to Visual Studio Code, we get prompted to resolve some dependencies. to the top of our file. The reason that we need this is because we do not have the "ReadAsAsync<T>" method available to us. But we do have "ReadAsStringAsync". This gives us the raw JSON that we can then parse using the "DeserializeObject<List<Person>>" method. Now that we've added our new files (again, these are technically "library" files, but I've put them in the console project for simplicity), we can get to modifying our console application itself. 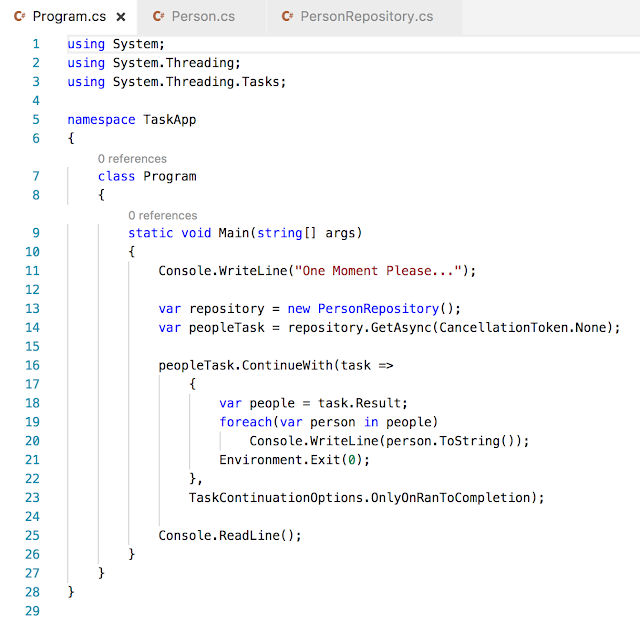 The "ContinueWith" method sets up a continuation, meaning code that will run when the asynchronous task completes. In addition, this continuation only runs if the task completes successfully (as denoted by "TaskContinuationOptions.OnlyOnRanToCompletion"). The continuation will print out the "Person" objects to the screen and then exit the console application. We have a "Console.ReadLine()" method to make sure that the console application does not exit before the asynchronous process completes. But we can hit "Return" at any time to stop waiting. With this in place, we can now run the application. Since this calls the WebAPI service, we need to make sure to start the service before running our console application. This will start the service at the location specified in the project. We'll need to leave the service running, so we'll go to another terminal window to run the console application. We don't have any error handling at the moment. so if we get an exception, then the console application will never exit. If the console application hangs at "One Moment Please..." (meaning, it doesn't do anything after the 3 second delay), then it is most likely that the service is not running or that it is running on a different port. If this result doesn't appear and the service is running, then check the location listed in the terminal where it says "Now listening on:". If it has a different location, check the previous article for instructions on how to change that. Both the console application and WebAPI projects are available on GitHub. The console application on GitHub has a bit more code to show cancellation, asynchronicity, and error handling. That will be our next stop. 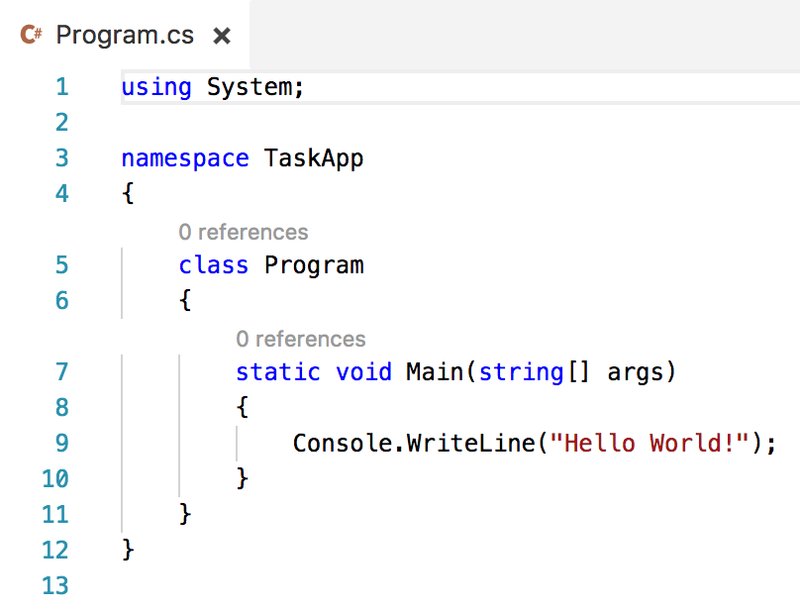 There's still a bit more to do with this code, but this gets us the basics for setting up a console application, consuming a web service, and even how to get NuGet packages into our .NET Core projects. Stay tuned because there is still much more to explore. Very nice article but I am getting null data .I made no modification of mine .Also,on debugging i am getting this info. 'Status=Waiting or activation. Method="null" Result-Not yet Computed." Cannot select the source code why you used images ?? ?